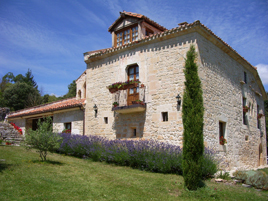 La Ondina is a beautiful stonewall countryside hostel house embedded in a large flower-garden, amidst a unique natural scenario. At countryside villa (“casa rural”) La Ondina, you’ll discover the quietness and fascination of a hostel house where wall-stone, wood and clay adobe merge, generating a cozy countryside atmosphere. You’ll be delighted by a cuisine based on organic vegetables and home-made jams, marmalades, spirits and bakery. La Ondina offers visitors four large rooms featuring a refined decoration and complete bathrooms. Plus the spacious common areas: living-room equipped with a log fire; library, equally with a log fire; and a broad arcade. You’ll be supplied with info about culture, sports and recreation in the area, and with the information required to prepare day trips from the villa. Right in the heart of “Las Merindades de Burgos” (Salazar, Spain), where the Arts, traditions and nature conjoin for your pleasure and rest.